I have seen a caterpillar this evening and want more information on this cute little thing. goto https://www.whatsthatbug.com/ but please crop the picture and fix the underexposure first before submitting image. 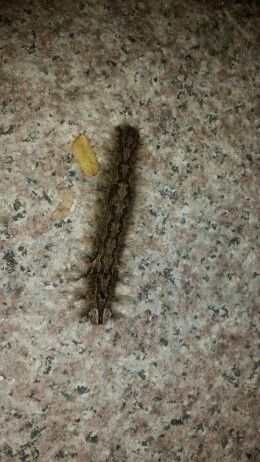 I think it's a Salt Marsh Caterpillar but I'm no expert. 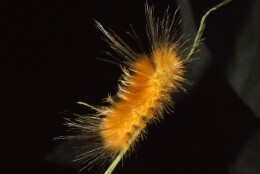 Sometimes I just make up name, I call this one Donald Trump Caterpillar. Took the picture early am with the sun shining in warming up the caterpillar which I had in the fridge over night so I can take a picture before the caterpillar starts moving away in front of a all black background. After the image I let it go outside. No harm. Have you seen this puppy? SO CUTE! I had to post this ADORABLE puppy video on here. It is ridiculously cute! (I would suggest turning off the volume on your speakers...the music is enough to drive you insane Cute Little Puppy! Have you ever seen a shooting star?